Xiu Man Huang of Taiwan often thought of giving up on life. But she knew she couldn’t leave behind her family, especially her two children, both multi-handicapped with severe autism. In addition, her husband has a chronic disease and receives treatment at a long-term care facility, where Xiu Man often visits him. She also has a married older daughter, who has a busy life and schedule. Her 22-year-old son lives at home, requiring Xiu Man’s care. Her 17-year-old daughter studies at TaiChung Special Education School, but Xiu Man must accompany her to and from school because she cannot go by herself on the bus. “She has serious emotional problems and needs long-term medical treatment in order to alleviate symptoms and self-inflicted behaviors,” she says. Because of her caregiving responsibilities, Xiu Man was unable to work outside the home and was struggling financially. To support herself, she learned how to make handicrafts, such as handmade soaps, candles in glass jars and innovative note cards, selling them to organizations. I had thought about giving up on life, but I just didn’t have the courage to leave my two younger innocent children behind. Since she didn’t have a storefront and was busy caring for her two children, she was not successful with sales and business was limited. Xiu Man was driven by hope for a brighter future, even when the demands of life seemed to great to continue on. Supplementing her income with part-time cleaning jobs, she had another idea. She decided to try Internet marketing strategies to sell her products, even though she had never used a computer in her life. Xiu Man’s dream, however, has been not only for her family. She wants to mentor other adult autistic children and create a “work haven” for them. My own autistic son could not go out to work and I would like to provide opportunities to let other kids with similar situations be able to have a place to work and make a living to improve their family lives. After establishing a web-selling platform and successfully reaching her sales goals, Xiu Man plans to work with the TaiChung Autism Educational Society to help families with situations like hers sell their products through her web store. The president of the society, May Bee Wang, says of Xiu Man: “She is a responsible and strong woman. It is hard enough to imagine taking care of three mentally disabled people (her husband, son and daughter), but not only does she do that, she is able to help many similar families who are looking for resources in the society. 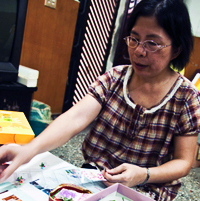 As a Soroptimist Live Your Dream Award finalist, Xiu Man can now learn more skills and broaden the scope of her Internet handicrafts sales capabilities. “This leads the way for more families with autistic conditions to follow my entrepreneur model,” she says. I had the courage to apply for this award because I wish for a beautiful future. Ultimately, Xiu Man is grateful to work at home and to be able to care for her children. And she continues to look forward. “We can not relive our lives, so we all must look to our future,” she says.